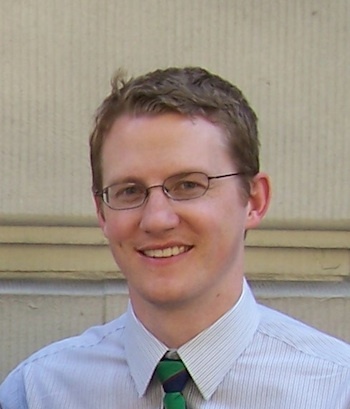 Curtis Broadbent is a post-doctoral research associate in Professor Joe Eberly's research group in theoretical quantum optics (ERG) at the University of Rochester. He is currently investigating non-Markovian effects in open quantum systems. Curtis graduated in August of 2010 from John Howell's experimental quantum optics research group (HRG) in the Department of Physics and Astronomy. While in John's group he worked on projects related to quantum image state discrimination, slow light with entangled photons and pseudo-thermal light, and applications of bipartite photonic entanglement to quantum cryptography. Additionally, he collaborated with Andrew Jordan's research group (JRG) on an experimental and theoretical investigation into non-local weak-value measurements. Curtis completed his undergraduate degree at Brigham Young University with a BS in Physics in 2003. At Brigham Young University he worked with Scott Glasgow and Justin Peatross on dynamical notions of energy loss and irreversibility in phenomenologically modeled dielectric/field systems.